Lilbert-Fils is a tiny Champagne property with only 3.5 hectares of Grand Crus in primarily Cramant and also Chouilly. Made by George Fils (with his son Bertrand) who has recently taken over for his father Georges. About 30,000 bottles a year are produced and available at the very least in the USA, Belgium, Germany, and of course France. They have producing Champagne since 1746. Note that some sources mention 4 hectares of vineyards with an additional holding in Oiry, but the excellent although brief French language Website does not. I'll assume the Web site is correct for now and should be visiting Champagne soon. I definitely do drink the wines and have them in my cellar as well! Clearly a Grower Champagne, they utilize only grapes from their own vineyards, and produce three cuvees, two of which I've had the pleasure to try, the NV Cramant Blanc de blancs and Vintage Cramant Blanc de blancs. The Vintage wine is 100% Cramant since the 1995 vintage and the Non Vintage (NV) has grapes from all their vineyards. Not surprisingly, the Vintage is only made in superior years. The NV is a blend of 2 to 3 years, usually consecutive vintages. They also make another NV Blanc be blancs labeled "Perle," and although I've never seen nor tasted it, it's an old wine NV that ages in the cellar an extra one or two years longer than the regular NV and comes from vines dating back to 1930. 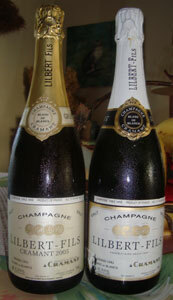 Lilbert-Fils Champagnes are often described as having a "taut, steely, rigorous quality" and being less "soft, creamy, and flowery" than most Blanc de blancs, and I pretty much agree although they are delicious at youth, the NV more to my palate on release (they hold their wines 5 years before release). They also sell some Champagne to a big house for their prestige cuvee, presumably for blending. The wines are produced very traditionally, with all work done by family members. Hand riddling and manual final disgorgement is done manually without using ice to freeze the dead yeast cell plug into the neck of the bottle. These fine wines have high acidity, sweetness, and structure and are known to age long and well. This is easily believable based on the high quality, structure, and makeup of the wines and I hope to hold on to a few for 5, 10 and maybe more years and report back then! As the brief notes below show, I enjoyed the wines young and certainly believe they will improve with time. This had a strong scent of elegant yeast immediately upon opening. Nose: Clean and crisp, nearly floral, with some maybe green apple, and surprisingly only a hint if yeast. On the palate, quite sweet and full bodied for a blanc de blancs, excellent acidity and well balanced. Held up to Clam Cakes (Northern New England Style). Some green apple as it warms. Pretty full bodied on the finish. Seemed bit rounder and smoother than the 2005 vintage, when drank in late 2011, but quite similar as expected. I think the vintage will definitely be better in the longer run, say 5 to 10 years, but not today. Both lovely, but the NV gets the prize today. I have a mere couple bottles cellared to try later.